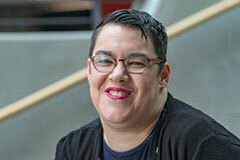 Anna Nelson is the dynamic force behind the promotion of accessibility at AUT. As the practice manager: disability support within the Student Hub, she can offer a world of assistance to students with disabilities. “I let them know we exist and they can choose whether they want to engage with us further, whether it’s the best way to get around campus in a wheelchair, or needing a note taker in class, a New Zealand Sign Language interpreter, writer or technological assistance. Societal changes are reflected by AUT in its progressive approach to assisting students with disabilities. The University is able to call upon external experts to help students who may be coming to terms with their condition. It’s a life-changer for people who otherwise might drop out of university. Anna also helps educate faculties on how they can support students. “In my role, I’m involved in the strategy behind the disability support we offer; ensuring that we as a team provide the support we should to students and looking at ways we can improve our services. A big part of my role is liaising with faculties and other parts of AUT to ensure our students can access all the facilities they need. As part of the Disability Access and Inclusion Network (DAIN) at AUT, Anna and her 20 champions across the campuses continue to educate and communicate about accessibility. Anna says that in her eight years at AUT she has grown in her knowledge and confidence, and this reflects AUT’s positive attitude towards change. “I can walk around today and almost be constantly saying hello to people I know; students as well as staff. At AUT I feel comfortable and a sense of belonging.